In the last post, we explained why a society that manages to recycle 100% of its waste would not necessarily be sustainable. Our goal should be not only to recycle more, but to waste less. Europe imports 5 times more energy and resources than it exports, hence most of the trash that we bury or burn in Europe is not “ours”; is not always going to be there. In a world with finite resources and where emerging economies use more and more resources the Europeans will have to learn to make more with less if we want to keep our comfort standards. This is a radical change; what matters today is not labour productivity –as it has been since the industrial revolution- but the material productivity. Europe has to dramatically increase the efficiency with which it handles the resources and burning or burying them is not sensible. 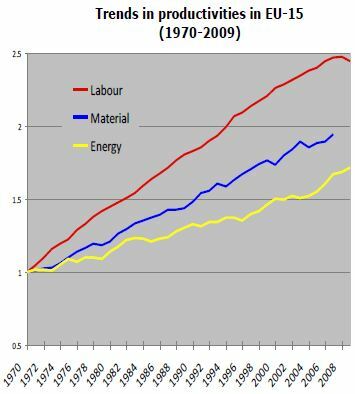 See in the graph below -Eurostat data- the difference between the increase in labour productivity and material productivity in EU15. For instance, one-way containers might make sense for the internal economics of some packaging companies but it is a very inefficient handling of materials which will be necessary in the future. Public authorities need to step in the markets to maximise the use of materials. Zero Waste as a continued effort to prevent, reuse, recycle, and still look into residuals to see what can be done further is a good approach to measure material productivity; an economy that minimises the residual fraction of the waste is more energy and material efficient than an economy that generates waste -be it in the extraction, transport, manufacture and consumption phase-. Besides the necessary increase of the material productivity for the future of the European economy there are other reasons to minimise the residual fraction. When we talk about municipal waste the most expensive waste to treat once we consider the obligation of pretreatment, financial liability, reduced thresholds for emissions, etc is the residual fraction (landfill and incineration), therefore if we reduce the amount of residual waste the costs for the municipality decrease which means that the citizen also saves money –less taxes-. Hence, also from a health and economic perspective it is always better to minimise the residual waste. The average waste generation in Europe is of half a ton per capita per year. Some countries generate 800kg/person and some others 350kg/person. The average recycling rate varies from country to country but if we look only to generation of residual waste –what cannot be reused or recycled- the average is around 300kg/person/year. An awful amount of waste! Lawmakers and institutions should be looking at the amount of residual waste much more rather than focusing on separate collection and recycling only. This overcomes problems of systems where the emphasis on separate collection might produce high recycling rates but with a concurrent increase of waste arising. The parameter “minimisation of residual waste” rewards communities and programmes where separate collection is promoted in parallel with waste prevention. Flanders is the European champion in waste management not only because it recycles more than any other country in Europe (75%) but also because it focuses on minimising the residual waste. The average residual municipal solid waste in Flanders is around 150kg per person. 42 Flemish municipalities are below 100kg/person/year and there are two municipalities below 70Kg: Herenthout with 8.350hab generates only 59kg per person and Balen with 20.000hab 66Kg are the two leading municipalities. But there are many others such as Aarschot (30.000hab and 84 kg) that are doing really well in their course towards sustainability. In Italy thanks to the implementation of the door-to-door collection system 1500 municipalities are increasingly reducing their residual waste. For instance, the province of Treviso -with a population of 1 milion- generates an average of 85kg/person/year of residuals and there is a district around Udine that generates only 65kg/person. In some small municipalities (some thousands of inhabitants) the results are extraordinary: Costigliole d’Asti thanks to achieving 82% of separate collection and the prevention policies the residual waste sent to disposal was of only 58kg/person/year. In Vilafranca d’Asti with 85% separate collection it was of 50kg/person, and in Castgnole delle Lanze with 84% separate collection they achieved the mark of 45kg/person/year! The results of the door-to-door collection system are proving to be so successful that the region of Lazio (5,5 million inhabitants) has made it compulsory for all the municipalities. In Spain the door-to-door collection has been implemented in more than 300 municipalities in Catalonia, Mallorca and the Basque Country and they have not only managed to increase the collection of recyclables –all above 60%- but also they have managed to reduce the generation of residual waste. 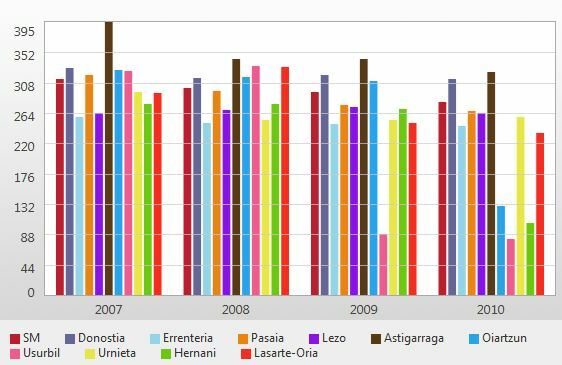 For instance in the Basque Country, the municipalities of Usurbil, Oiartzun and Hernani in one year managed to divide by four their generation of residuals thanks to the door-to-door separate collection (see graph). Currently Usurbil is at 80kg/person and Hernani and Oiartzun are approaching 100kg. The economics, the physics and the common-sense show that it is necessary to move towards Zero Waste – reducing the residual part of our waste to the minimum is vital to plan a future without landfill and incineration.